Is it just me, or is Twitter brimming with videos these days? They’re all over the place and I love it! After playing with easy video apps for years at this point (Years! That’s scary), I can easily tell if a video was created using these apps or not. But I’m always just a bit surprised when I can tell videos from big brands are made with free and cheap video apps. I mean, these are brands that have tons of money to spend on videos and easy access to pro videographers, but they’re using the same tools every solopreneur or one-man marketing machine could (should) be using. This, more than perhaps anything else, should illustrate that you don’t have to sacrifice quality to produce your own videos on a smartphone. That good videos don’t cost a lot of money. And that you can still make compelling content on the fly. To illustrate this point, I’ve shared seven videos you can make on an iPhone in 7 minutes or less over the past week or so on Twitter. Now, I’m aggregating them into a blog post for a quick reference/repository of ideas. This is about as simple as video gets! Unlike most videos, these types of videos aren’t meant to tell a story. Instead, they convey a small amount of information quickly and attractively. The motion of the test also adds some extra oomph to your social feed. Another benefit of a blog graphic video is that it benefits from higher organic reach on Facebook (up to three times higher than text or photos!). That’s a whole lot to gain from such a small amount of work! All you need to do is use one of a handful of apps, like Adobe Spark Post or Legend, to add and animate text on top of an image or video. And, you don’t even need to film or take your own photos. You can also use stock photos or video. A personal favorite of mine is Pexels, which offers both stock photos and stock video and doesn’t require attribution. Another pro tip? Have your brand style guide handy so you can make sure to match colors and fonts with your existing brand identity! Similar to the blog graphic videos, you can use these same simple apps to create short videos with tips or inspiring quotes. The benefits are the same: it stands out on a timeline, it has improved reach, and it also helps ease you into the process of making videos. A pro tip for these types of videos (blog graphics and tips/quotes): use Buffer to schedule your videos across social platforms easily and quickly. They’ll post as native videos on Facebook, Twitter, LinkedIn, Pinterest, Google+ and Instagram. And, unlike Twitter on a computer, Buffer can schedule mov files (as well as mp4 or avi), which is Apple’s standard video type. If for any reason an app saves the video as another file type (like m4v), you can use iConv to convert your video and audio files to other formats quickly and easily. This is a great resource if you need to send your videos to a coworker to post on social media—then, you can share them in whatever format they’ll need! You know from my style guide suggestion earlier that it’s just as important to remain true to your brand identity in your videos as you do in your photography and design. You want to use the same colors, the same fonts, the same overall vibe as you do everywhere else. But I’m sure you’ve seen videos shared before that don’t offer any context. They don’t credit the source, they don’t provide a link for more information. One way to make sure every person your video reaches knows where to look for more info (your website, your social profile, whatever) is to add custom intros and/or calls to action. The good news is you don’t have to hire someone on ZenDesk to make one of these for you. There are quite a few apps that allow you to make your own from basic graphics and logos. Adobe SparkPost is a great option for calls to action (the slide at the end of the video that tells users what to do: go here, read this, buy that, etc.). There are quite a few video effects apps that can be used to help create awesome branded intros. If you’d like a tutorial on my favorite app to make custom intros, you can sign up for my free 7-day e-course (it’s lesson 5, I believe). I’ll walk you through the process step by step! A pro tip here is having a handful of transparent PNG versions of your logo on your phone. I usually have one dark and one light version. Then, you can quickly overlay in on various colored backgrounds in SparkPost and import that video or photo file into the video effects apps to add light leaks (like mine), background textures, and motion. Even for quick video that you share directly from your phone to social media, there are branding options. For example, the app Pre-Edits allows you to quickly add a website and/or other text on top of your videos as you film them, so you can share them quickly without losing out on adding a call to action. What makes this particular type of video so great is that collage apps, like PicPlayPost, make it easy to put a handful of short video clips together into one video that tells a story from start to finish. It’s also great for beginners who don’t want to have to connect multiple clips together on a single timeline just yet. All you need to do is choose the layout of your video collage and select your clips. You can choose whether to play them all at once, or in sequence, and you can even loop them a few times. The app also allows you to add music from your library (just make sure you’re using royalty free music you are actually allowed to use!). Incompetech is great for free royalty-free music, but requires attribution. You can also buy a few soundtracks from AudioJungle or Pond5 to keep on your phone at all times and use as needed. You’ll notice that my collage video also includes a custom intro and a call to action. You can use a separate app, like iMovie, to string your collage and custom intros/CTAs into one cohesive video. I love tiny testimonials. For social sharing, I prefer them so much more than long testimonials. All you need to do is take out some of the best parts of that long testimonial and turn it into a tiny testimonial. The style I like to use is putting one great quote first, then my custom intro, then the rest of the quote and then my call to action. Otherwise, at least for social media, having that custom intro first might encourage people to scroll past your post before they invest in watching it. An important note: did you know that 85 percent of Facebook videos are watched without sound? Since most social platforms auto-play your videos (without audio) using captions at the bottom allows them to experience your video, follow your story, understand what you’re saying, without having to turn on the audio. One pro tip is to use the app Gravie to add text on top of your videos, like you see in my example here. It’s amazing how a timelapse can turn a simple video clip into something special. I use timelapse videos all the time for invitations—to webinars, to new courses I’ve launched, etc.—because you just need some props and an iPhone to make one. I prefer Lapseit to capture my timelapses, since it lets you re-time them to specific durations. For example, if I shoot a timelapse within the iPhone camera app, I’m stuck with what I get. But, if I shoot it in LapseIt, I can reformat it to be however long I need it to be—10 seconds, 30 seconds, a minute, whatever! Lapseit also allows you to add music from your library to make this type of video even easier. Not every business has an abundance of things to “show” their audience. Some of us work in more cerebral environments, and watching people think or type doesn’t make for a compelling video. Fear not! Animated explainer videos are great for companies that want to share concepts and ideas, rather than visuals and experiences. They also work well for numbers or even videos accompanying blog posts, like my example here. There are quite a few apps that allow you to create animated videos. Some use cartoons, some rely on icons, some use your own photos and visuals. Finding the right one depends on your brand identity. I actually have a whole module on this in my latest course, LittleBig Video, to show you exactly how to make animated videos (as well as all the other videos I talk about—and a bunch more) on your phone really quickly and easily. You can learn more about the course here. Plus, for a limited time only, ASBPE members can save an additional $50 by using the coupon code ASBPE. 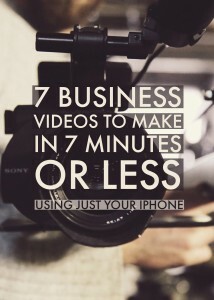 There are a ton more types of videos you can make in only a few minutes using just your iPhone, but that’s the end of my 7-minute video blog series. To learn more types of videos, or to follow step-by-step tutorials, check out LittleBig Video. I hope to see you there!